Is Outsourcing Your Admin Safe? To put it plainly, the world of work has changed dramatically within the last several years. Once upon a time, a person could expect to stay in the same job, work from 9 A.M. to 5 P.M. each day, and travel both to and from work five times a week. But these days, the alternative of sitting at a desk in your own home, a cafe, or a shared work space, is rapidly becoming the norm. In fact, according to a 2017 Gallup poll, 43% of American employees reported that they work remotely at least some of the time. Granted, remote employment boasts a lot of benefits. It has been shown to improve productivity, as individuals isolated at home are less likely to be distracted by “work gossip” and office politics. A Staples survey interested in the attitudes of millennials currently working remotely discovered that 59% say they are more productive thanks to the increased flexibility. In a similar study by Vodafone, this figure increased to 83% of respondents, who also stated that remote working increased productivity. But remote working, like anything else in life, also comes with challenges. One such challenge is in administration. As more and more businesses have been encouraging working remotely by their employees, and as smaller organizations begin to realize that they do not need permanent office space, the need for a Virtual Personal Assistant (VPA), and outsourcing certain aspects of a business, increases. Why A Virtual Personal Assistant? When an office becomes nebulous and a team becomes highly dispersed, organizing a business can become more difficult because people who work remotely do not have a central place where they can check in. When an office becomes nebulous and a team becomes highly dispersed, organizing a business can become more difficult because people who work remotely do not have a central place where they can check in. That daily coordination of who is doing what, when, and why is much more difficult to manage. Remote working does allow organizations to work more fluidly, and alleviates cost and overhead, but that doesn’t mean that the administration of employees and business processes doesn’t still need to be handled by someone sitting at the center of it all to coordinate day-to-day operations. Enter the Virtual Personal Assistant. While disputes continue regarding who first developed the idea of the VPA, the first incarnation as a business was with the company Virtual Assistant, Inc. in 1995. Since then, the industry has taken off. These days, a VPA will often work from their own home as a freelancer, but a number of agencies dedicated to offering Virtual Personal Assistant services have also sprung up, and they cover everything from personal assistance duties to financial admin, and even customer support. 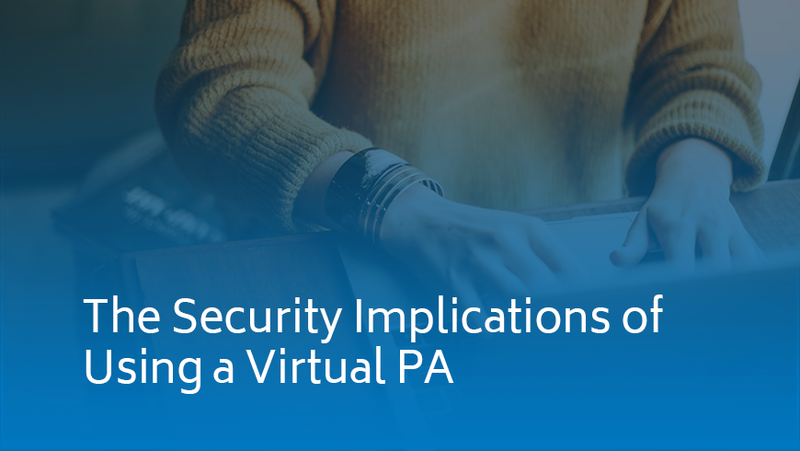 Due to an organization’s dependence on them for a great many services, VPAs may well be privy to personal or company proprietary information, including intellectual property, and as such, they have the potential to be a point of weakness in any security strategy.